Gareth Barsby is a graduate of the University of Chester, where he studied Creative Writing and Journalism, but for most of his life, he has used writing to explore weird new worlds. He has a blog where he puts up his written work - myweirdwriting.wordpress.com – has self-published three books – The Werewolf Asylum, Barking Benjamin and Mr. Movie-Maker – and has submitted short stories to several publications. 1. Santa as an agent of Purgatory is a new wrinkle. How did you come up with the idea for Reindeer? Reindeer is meant as a love letter to my favourite Christmas stories from childhood, and it came about through thoughts on them. Like, I was thinking about the fact that the two most prominent Christmas stories are stories about Santa Claus and Christmas Carol spin-offs, despite the fact that the former is about candy canes and happy elves while the latter is about ghosts and graveyards, and I thought about if there was still a chance these Christmas characters could still be real, even though we now know it was our parents that were giving us our gifts. No-one’s found Santa at the North Pole but he could exist in another plane of reality. Santa doesn’t give people Christmas presents on this plane of reality, but what’s to say he doesn’t on another plane? So I thought Santa living in Purgatory would allow me to write a story where he could be real yet have people in the “real world” not believe in him, and would allow him, his elves, his reindeer and Toyland to better co-exist with the undead characters of A Christmas Carol. It would also mean putting familiar characters into a new world, which I thought would be a good challenge. 2. Can you tell us a little about your writing process? Did you sit down with cocoa and a candy cane, for example, to write Reindeer? Play holiday carols as you typed away? Well, replace “cocoa” with “a tonne of coffee” and “a candy cane” with “even more coffee”, and the second sentence is accurate. I did play some music to help immerse myself; not necessarily always holiday carols, but music that I felt evoked Purgatory so I could feel like I was there with Randall. The writing process was mostly just sitting myself down and typing out the story. I enjoy writing fantasy stories because I find it fun creating a world and its “rules”, so what was probably the most fun thing about Reindeer was creating my own vision of the afterlife. That and creating a new adventure for my favourite Christmas characters. 4. If you had to choose, which writer would you consider a mentor and how is that reflected in your work? I’m not sure I can choose just one mentor. Stephen King’s On Writing was a big help for me and so was How Not To Write A Novel. I’ve been influenced by Bram Stoker and Mary Shelley and Lewis Carroll and Gregory Maguire, and I don’t know which has influenced me the most. Stephen King said to be a writer you have to write a lot and read a lot, and I think that in a way, everything I’ve read has had a little influence on my writing. 5. What is your current project and can you share a little of it with us? I have no major projects at the moment, but I do still write short stories and poems from time to time, and I, of course, put them up on my blog. 6. You're an author. What do you enjoy reading? I enjoy reading all sorts of things. I especially like horror, like Thomas Harris’ Hannibal books, and retellings of older stories (recently finished Christina Henry’s Alice). I also like reading poetry, especially humorous poems like those by Edward Lear. 7. What would you like most for Christmas? Our First Christmas Book, Plus a Giveaway! Presenting our first Christmas novel: Reindeer by Gareth Barsby! This isn't like other Christmas stories, though, which usually leave you in a diabetic coma. Is it a mystery? Well, there is a criminal conspiracy. Is it horror? There's a scary ghost, and a lot of dead people. Is it a metaphysical fantasy? Um... probably. Santa Claus never lived at the North Pole; he lives and operates in Purgatory. He brings presents to those that have not yet ascended to Heaven in order to give them hope. His elves and reindeer are the spirits of those who died during Christmas. 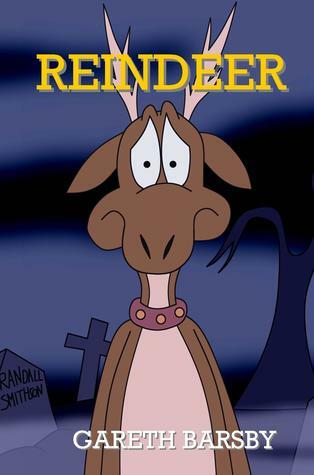 Meet his newest recruit, Randall, a Christmas-loving human turned into a confused and curious reindeer. It’s bad enough for Randall that he now has to live in a world where happiness and saccharine is forced onto him daily, but then he learns that the Ghost of Christmas Yet to Come has history with Santa, and a crooked man is practicing necromancy so as to ruin Santa’s operation. Can Randall thwart the evil plan and save the holiday he loves? To find out, visit Amazon, or enter the giveaway below!